The first layer of the domain model provides a verification of whether an image itself or its property can be changed. An admin or image owner can apply the changes. The information about a user is taken from the request context and is compared with the image owner. If the user cannot apply a change, a corresponding error message appears. The second layer of the domain model is optional. It becomes available if you set the property_protection_file parameter in the Glance configuration file. The property protection layer manages access to the meta properties through Glance’s public API calls. You can restrict the access in the property protection configuration file. Defining access rules to perform actions with an image. The rules are defined in the etc/policy.json file. Monitoring of the rules implementation. If the quota does not exceed the limit, then the action to add an image succeeds. If the quota exceeds the limit, then the action does not succeed and a corresponding error message appears. 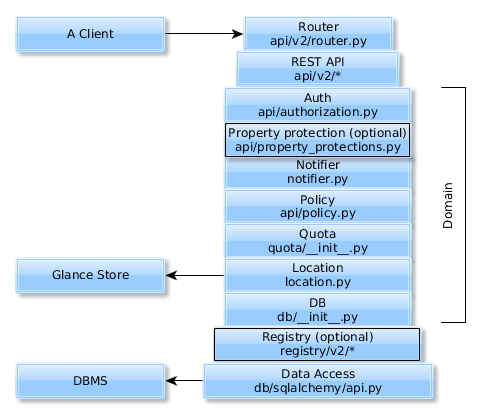 The sixth layer of the domain model is used for interaction with the store via the glance_store library, like upload and download, and for managing an image location. On this layer, an image is validated before the upload. If the validation succeeds, an image is written to the glance_store library. The methods to interact with the database API are implemented. Images are converted to the corresponding format to be recorded in the database. And the information received from the database is converted to an Image object.